We specialise in all types of electric underfloor heating systems for all floor coverings, throughout the UK. 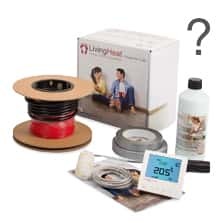 Our aim is, to offer you the best floor warming and heating kit solutions at an unbeatable price and service. If you have any questions or require assistance with your underfloor heating projects please don’t hesitate to contact ourselves. Our electric underfloor heating kits are all designed for both gentle floor heating or to be used as a primary heating. We hold large stocks of all our heating supplies and ancillary products ready for next day delivery, which all come backed up with a no quibble money back guarantee should you change your mind. Our time and advice is free and we are happy to help, so if you require electric underfloor heating supplies then give us a call. Planning Your Underfloor Heating System. If you need help or have any questions Please feel free to call us on 01803 316060 our time and advice is free. We invest heavily in our staff to make sure they are able to provide accurate information on all underfloor heating systems. Whats the Best Underfloor Heating System For Me? When deciding on the best underfloor heating system for your project there are a few key points to consider. Will the heating system be used as the primary heat source or for simple floor warming? All our heating systems are suitable for use as a primary heat source but sufficient floor coverage will need to be fitted to achieve this. What is the sub floor constructed from, ie wood or concrete? Is there any insulation already in the sub floor. 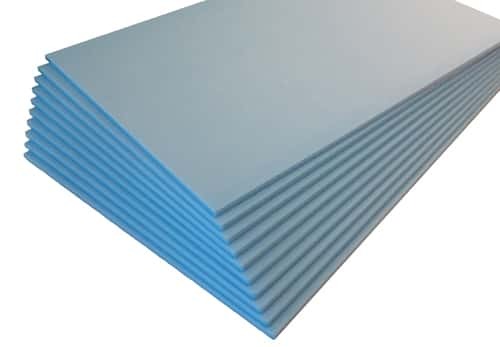 Will it be necessary to install additional insulation over the sub floor? If the sub floor is uninsulated insulation is very important especially over a uninsulated concrete floor but insulation must always be considered as this can often make all the difference. What shape is the room? Some systems are very adaptable and can be fitted into very awkward and small areas. Other systems are difficult to adapt so are best used in large regular shaped areas. We have systems suitable for use with all floor coverings and all sized areas so if you can not find what you are looking for or simply need some advice please feel free to contact ourselves where one of the team will be happy to help. Insulations For Under Tile, Wood, Laminate and Carpet Floors. 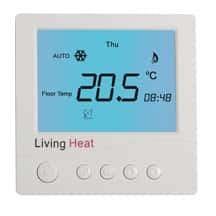 Our thermostat range includes manual thermostats, digital thermostats and touch screen thermostats. All our units have been designed to have a modern low profile sleek design but remain clear and easy to use. 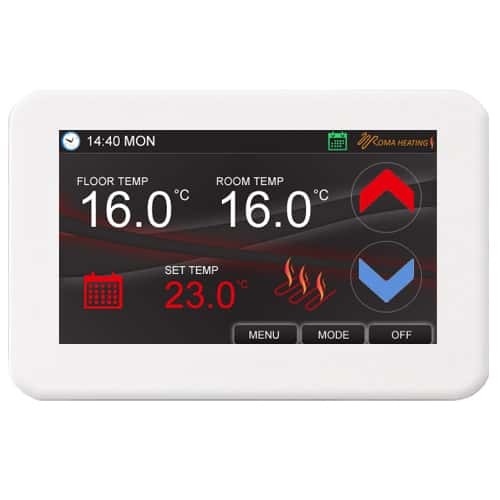 All our controllers except the manual unit can be fully programmed to automatically control your underfloor heating to automatically change the to temperature to suit your home and lifestyle. As a one stop underfloor heating supplier, we stock everything you will require to complete your installation. When ordering underfloor heating in Australia, all orders are dispatched on a priority 3-6 working day delivery service. If you are looking for under floor heating in Australia and would like a quote just send us an email sales@underfloorheatingworld.co.uk or give us a call 0044 (0)1803 316060 and we'll get back to you with a quotation you will not beat. Notre chauffage est conçu et certifié pour une utilisation en France et toutes les commandes sont expédiées sur un travail service de livraison prioritaire de 2-3 jours . 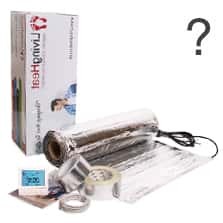 Si vous êtes à la recherche pour le chauffage au sol en France et souhaitez obtenir un devis suffit de nous envoyer un courriel à sales@underfloorheatingworld.co.uk ou donnez-nous un appel sur 0044 (0) 1803 316060 et nous reviendrons vers vous avec un citation que vous ne serez pas battre.